1. Rinse and sort the beans. 2. Place oil into the pot and heat. Add two green onions, white or yellow onion, celery leaves, and garlic. Sauté until onion is tender but not browned. 4. Bury ham pieces or sausage in beans. 6. 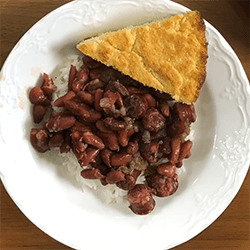 Serve beans over hot rice. Top each serving with a generous sprinkling of green onions.